To the poorest of the poor. Sadly, many of Mozambique’s estimated 700,000 orphaned children are stigmatized further based on gender. More than half of Mozambique’s young girls can’t read or write, and some fall victim to pimps, drug dealers and human traffickers who abuse and exploit them. 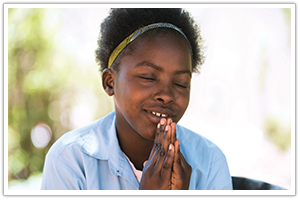 Association Cross Mozambique (ACM) has a solution to this problem, by providing at-risk girls with a quality Catholic education. Younger girls are sent to the Namaacha Boarding Home and older girls are given the opportunity to attend St. Joseph Institute in Inhambane. While living at the homes, the girls receive nutritious meals, practical job skill training, mentoring from the sisters and spiritual formation. Please — help impact the lives of this generation and generations to come by contributing to the ACM Girls’ Rescue Project. Click here for more info or donate now below. © 2019 Cross Catholic Outreach. All rights reserved.